Clearly inspired by Stephen King's opener to this collection, whatever else one could say about the contents of the final volume to the series, one cannot argue the cover painting is unforgettable. Harold Parkette enjoys the sight of a well-tended lawn, but is less enamoured of the prospect of putting in the work required, so employs a neighbour’s kid to push his lawnmower around. But when the young man disappears off to university, Harold just lets the grass grow and grow. He finally decides to do something about the wilderness he has cultivated so, picking up the local paper calls the number on a classified advertising “Lawns Mowed”. But what turns up is the lawnmower man from hell. Sort of. When King writes with a twinkle in his eye, as he assuredly does here, the results are invariably a delight. His description of the lawnmower man (green pubic hair and all) is unforgettable, as is his little bird-table joke towards the close of the narrative. Equally fine are the opportunities King takes to have a sly kick at things which plainly irk him: the intimidating self-confidence exuded by tradesmen, the blind trust Republicans place in money-men and the shortcomings of overpaid sportsmen – specifically a pair of named Red Soxers. I came away slightly unsure whether Parkette was already on a collision course with Pan’s man due perhaps to either the crime of ignoring his grass or the earlier death of a cat . Or did he, rather randomly, initiate the whole sorry business with his phone call? As the opening line of this yarn attests, “Bobby Shaftoe was a hirsute man”; he being so covered in bodily hair as to seriously affect his self-confidence. An encounter with a fakir leads to the loss of all his hair, but that is fine for the fakir has a scheme in mind which will allow Bobby to re-grow it. Following on from the silliness of his other Indian sub-continent based epic in Pan29 The Joonka Junka, Pickles weaves another yarn of superstition and faux-magic, where the protagonist’s subconscious may or may not be their own worst enemy. But into this one is layered more than a hint of lycanthropy. I never really engaged with Shaftoe or indeed any of the characters beyond the pleasingly bonkers doctor; a bored general practitioner with a hankering towards Freudian psychoanalysis. It is a few days before Christmas and Cathy has found herself alone manning the phones overnight at the offices of The Samaritans. She is so moved by the despair in the voice of one caller – a teenaged girl who has recently lost both her parents and her brother - that she decides to ignore her training and break all the rules by making a personal visit as soon has her shift finishes. The plot of this one harks back to the sort of motiveless carnage which began to proliferate within the Pantheon around the late 1960s, and I should not be surprised if the author grew up reading such collections and decided (probably quite correctly) that he could do better himself. Unfortunately by the end of the series such narratives were old hat, and I found this tale dull, pedestrian and (worst of all perhaps) utterly predictable. As an aside, I have always been rather puzzled as to why the parable of The Good Samaritan is often cited as an example of Christian virtue. For it is plain that whatever religion the Samaritan of the parable was, he most certainly could not have been Christian. Another lone Samaritan holding the fort, another caller threatening suicide and another against-the-rules home visit. We have all known a weirdy-beardy like that in our time, I am sure. Six-year old Jamie has a massive crush on his 15-year-old babysitter Natasha; he determined to marry her when he grows up and, in the meantime, to protect her from dragons and other creatures which may wish her harm. So when he toddles back downstairs after being put to bed one evening to witness his love apparently wrestling on the floor with a boy she has invited along, he knows what he must do. The old PBoHS series favorite of a murderous child enjoys a last hurrah with this harmless and innocuous yarn. The plotline reminded me a touch of The Nursery Club in Pan12 but Princess, regretfully, enjoys neither the overall sense of menace nor the jarring punch-line of its predecessor. Billy Govan has recently escaped from Glasgow’s Barlinnie Prison and has fled south to a small Galloway fishing village. But he has no intention of simply hiding out there, for he has formulated a convoluted scheme which he hopes will set him up financially for life. At just under fifty pages this one nudges into the realm of novella, but in Mr. Temperley's hands the pages fly past, with the scene of Govan’s on-deck assault on Magnus and his son a real tour de force. And whereas the author’s many previous contributions to the series had been either psychodramas or out-and-out supernatural horror stories, here he walks a fine line between the two, dropping hints at the supernatural but leaving the reader to make up their own mind. Swallowing the premise that Govan was able to pick up enough seafaring info from a cell-mate and a book from the prison library to fool an old salt like Magnus, does require a hefty dose of belief-suspension though. But hey, what is fiction for? Govan himself really is a brutal piece of work and (General Ngwami apart) arguably represents Temperley’s nastiest character; note the way he casually picks up the chocolate from his cabin on his way up on deck to murder the man who gave it him as a gift. An excellent entry, with my only real gripe being the title, which I would suggest pretty much gives away the ending as effectively as any of my spoilers above. A woman has fainted whilst waiting in the queue for a Number 13. Whilst unconscious she has dreamt she did in fact board the bus, and it was driven out into unfamiliar countryside by, as she discovered when she attempted to confront him, Mr. Grim Reaper. Upon waking in hospital she writes down an account of her dream, and taking it as an omen, decides to walk rather than take the bus in future. But she is killed crossing the road by a number 13 bus. The above is my chronological recounting of events; although Rosemary initially confuses us slightly by not making the reader aware what they are reading is epistolary. But this aspect is the sole redeeming factor of this rather pointless two-pager. As many first children do, young Roger resents the arrival of his new sibling, so decides “it” must go. This he achieves by placing the sleeping family cat Mog over his unfortunate brother’s face. After the funeral, the innocent cat is hauled off to the vet to be put down. Roger feels no guilt over his brother’s death, but the fact his actions also led to the death of the family pet which come back to haunt him. Although the likes of Martin Waddell (if one includes pseudonyms) and Norman Kaufman provided more stories to the series, no-one spanned The Pantheon as broadly as Rosemary Timperley – her thirteen contributions being spread across Pan4 to Pan30. The lady died in 1988 so never lived to see this yarn (and the previous) published in Pan30, although I am unsure when the story was actually written. But it certainly does feel a bit like the work of an individual way past their creative best, and going through the motions somewhat. “Put to sleep? But he was always sleeping”. The little cat-hair clue in the final scene does hint (as does the title, of course) at the supernatural being at play here. But the tale is so weak, we do not really care. Due to a slight directional shift in the fickle wind of fashion, Haldeman’s exclusive L.A. restaurant is going bust. In debt to the hilt and with a potential alimony case on the way, he has decided upon the time-honoured escape route of arson followed by insurance claim. After fiddling with the piping on the kitchen barbecue unit to ensure a catastrophic explosion when his unfortunate chef next lights it, he retires to a dingy desert motel well away from the scene of the crime. To bolster his alibi he asks his restaurant manager to call him at precisely the time the plan is likely to go bang. This one maintains the reader’s interest by keeping him/her guessing just how things are going to foul-up, as they assuredly must. Haldeman’s mode of demise when it does arrive is so left field as to come as a genuine surprise, although one could argue there is a definite heat motif running through the narrative. But the whole plotline appears hinge upon a rather contrived necessity that Haldeman must receive the call from Hyatt at the proscribed time. I should have thought whether he is on the phone or not would be irrelevant to his alibi which would, in the most part, be provided by the motel manager. A collection of animals (Dog, Cat, Mouse, Rabbit, Baboon etc.) are in an operating theatre performing open heart surgery on a human; this sort of thing commonplace apparently since “the Rebellion” when animals, tired of being on the end of medical experimentation, overthrew the human race. I should imagine Animal Farm to have been at least a catalyst for this story’s creation, for although the anti-vivisectionist lobby may superficially delight in this one, ultimately what we get is Orwell’s (or Townshend’s) “Meet the New Boss, same as the Old Boss” outcome. “And their psychotherapies and their physiotherapies and their hydro-bloody-therapies”. All in all a rather tame final contribution from Mr. Kaufman, who had presented Bertie and Clarence with some delights over the years. This gathering together of a trio (Kaufman, Temperley and Timperley) of venerated Pantheon alumni leads me to believe Clarence strongly suspected that Pan30 was going to be The Last Waltz. Cousins Kate and Danny are inseparable, despite the ten-year gap between them. Kate would always look out for her younger cousin, protecting him from those she felt meant him harm: his bully of a music teacher, the sexually precocious Maddie from his primary school class, a rival for a maths prize, and even from Shelagh his first adult romance. It came as bit of shock reading the opening paragraph of this one, where the narrator outlines the mechanics of the Trust Me Game, whereby he would allow himself to fall backwards safe in the knowledge his cousin would catch him before he hit the floor. For I used to play the same game with my daughter, we thinking we had invented it. Fortunately, at least thus far, I have resisted the use of murder to progress the business, something the clearly off-her-trolley Kate had no qualms about. The final scene between Kate and Danny is pleasingly ambiguous. Surely Danny cannot have had some poison hanging around the house just on the off-chance? Barry is relocating his family to London, 200 miles away from their current home. The move involves the inevitable property downsizing and an unfortunate consequence of such is that Shep, the family Alsatian, has been lined up for a one-way trip to the vet. But when push comes to shove, Barry finds he cannot go through with the act, so instead lets Shep loose on the moors. But not only is Shep a homing-dog apparently, he is also a decidedly vindictive one. This yarn in many way acts as a counterpoint to Little Boy Haunted earlier in the collection, wherein a cat gained revenge by supernatural means. And like the latter, this one is also, disappointingly, little more than filler. Barry is certainly an interesting character though. When his wife tries to persuade him with her “pleading, spaniel eyes" that Shep could still come with them to them to London, he is utterly indifferent. And yet one look into Shep’s “brown trusting eyes” has Barry putting into action plan B. After Shep’s attack we almost expect him to splutter “The Cherry Hog’s only gone an’ ripped aht me Ferret and Stoat”. I did like the way the lump in Barry throat as he contemplated Shep’s vet visit grew from “the size of a billiard ball” to “the size of a football” and then to being an “impossibly large blockage”. All of which presciently predicted the time when Shep’s jaws would rid Barry of the potential for such blockages forever. The habitants of a village in northern India are just finishing gathering in their mustard harvest when the long shrieking cry of a Churial (an evil spirit in female form) is heard. All present know this to be a portent of something terrible about to happen to one of their number. The very next day a twelve-year old girl whilst out collecting wood is mauled and severely disfigured by a bear. When she staggers home her mother, realising the girl will now never be able to be marry, smothers her to death. The summary above is just sort of it as far as the plotline goes. The rather intriguing Churial of the title does little more than shoulder its way into the first few paragraphs, howl a few times, and then disappear once more. Hence the only real mystery we are left with is: will it be a bear or a tiger that does for the girl? Indeed, one could argue the intrusive insertion of the evil spirit into the narrative is superfluous, given Seshadri’s lengthy passage on the ecological impact corporate greed has had on the area. As with the author’s other contributions this one is set on The Subcontinent, and hence littered with local words which the typeset has italicised. In the absence of a glossary, I found having Wikipedia open on the mobile phone as I read this a real help. So: an entertaining (indeed, one might even say educational) read, but one ultimately lacking the vicious bite of the author’s The River Bed in Pan26. Only after moving into their new house did Sharon learn of the vicious motiveless murder which took place there some thirty years earlier. Attempts to unearth all she can about the crime has led to her experiencing a recurring nightmare in which she is the helpless witness to the event. Another problem is that the crime was so infamous that the house has become a place of pilgrimage for all manner of ghoulish individuals. And Sharon is taken aback when one such arrives at the door, marches into the house, and asks if she wishes to see exactly how the murder was committed. The narrative of this one launches straight into what is so obviously a dream sequence, that when it was confirmed as such I thought: “Oh here we go, another predictable journey”. But I think the author deliberately lulled me into a false sense of complacency, because when the twist did come along, I have to hold my hand up and admit I never saw it coming. Martin Porlock is in receipt of a journal written by his late father some fifty-years earlier, telling the tale of how his father's fiancée drowned. Taking the premise of John Carpenter’s 1980 horror-flick The Fog, and simply translocating it to Cornwall hardly sounds the most promising premise for a short story. But layer in the sort of sexually ambiguous undertones Robert Aikman used in Ringing the Changes (Pan 4), plus a cast of characters close relatives to the regulars of The Slaughtered Lamb as seen in An American Werewolf in London and you have a quite beguiling tale. There is a couple of little failures of continuity which the reader may only pick up on the second reading. All facts point to the action described in the journal as taking place in 1928, so why does Martin’s father state to the sextant in the churchyard that the crew of the Lady Fortune have been dead for 150 years – which would date the conversation to 1982? Also the manuscript as written initially talks about Martin the third person, but by the end it is being addressed to Martin. But as it is supposedly the ramblings of a deranged man during his more lucid moments, perhaps Cruise dropped these inconsistencies in intentionally. In any event, “The Sea… “ is such a gripping and tense yarn with which to close out Pan30 that it almost makes one glad there was no Pan31 to spoil things. Hi Ian, like you I read most of these Pan books back in the 70s when I was a teenager, and I've actually still got them in a box in the attic somewhere. I've just spent the small hours of the morning trawling through your lists re-discovering the stories, but couldn't find a particular one I've been meaning to read again. I recall it was a very long story about a haunted house, complete with poisoned wells, mutant trees and a madman in the attic, where the protagonist for some reason continued to live there even though the house got worse all the time. Perhaps you could point me towards the right volume so I can dig it out. I'm wondering if it was a Pan story at all now. Pretty sure it wasn't The Magic Cottage by James Herbert which I also read around that time, but it was of that ilk. Chris from Purley. I think you might be referring to Lovecraft's "The Color Out Of Space." Scared the hell out of me when I was a kid the thought of this thing just quietly infecting the water, then the land, and then everything; every so slowly. Lovecraft was not a great wordsmith but the ideas he created really haunt the memory. It ain't no PBoHS entry I can recall. Sorry. Are you perhaps thinking of Lovecraft's "The Color Out Of Space"? Lovecraft's "The Color From Space" perhaps? Read your reviews. They certainly took me back. 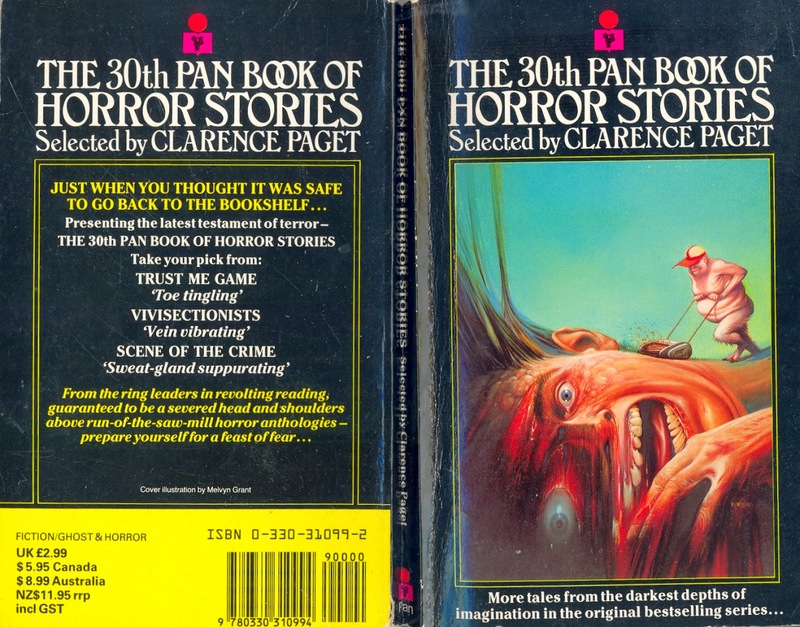 The Pan horror stories are a little bit like the literary equivalent of the Carry On films, mainly crap but often hugely enjoyable. As you get older your tastes become, thankfully, more refined, so tales like the ones written by the aptly-named Mr. Rough disgust rather than amuse. The series certainly became more pornographic over the years, to its detriment I think. Still a fondly remembered guilty pleasure though. Thanks for you hard work, it brought it all back. Regards, John. On the back of this brilliant web site I went out and bought numbers 1 - 29 and thoroughly enjoyed reading stuff that terrified me as a teenager. It is a mixed bag but when it was good it was great. Sadly number 30 is still languishing in the silly money corners of the internet but an old copy's bound to turn up some time. Thanks for all your hard work, Ian. Thanks Bob. Keep looking, Vol 30s are out there at sensible prices.